The Degenerate Era has now passed. It is 10 to the 40th power year from now. To give some perspective on how far into the future this is, this is a 1 with 40 zero's after it! Ten duodecillion years. All the stars have gone and Black Holes rule the night sky. Not that we will ever observe them as it is almost certain there will be no planets left to orbit the stars. The Universe is now full of stellar mass and supermassive Black Holes. So is this it? Eternal Black Hole governance of the cosmos? The short answer is no. So what happens to the Black Holes? They evaporate! So the infamous Black Hole cannot overcome the end of the Universe. World renowed physicist and cosmologist Professor Stephen Hawking theorised Black Hole evaporation in what is now called Hawking Radiation. As we discussed, a Black Hole is a body with immense gravitational energy and mass. 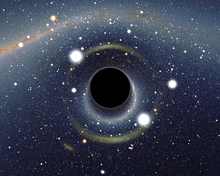 Hawking theorised that beyond the event horizon of the Black Hole can create particle and anti particle pairs.As these particle pairs are created, this very slowly reduces the mass and energy of the Black Hole. It is important to note that these particle - antiparticle pairs do not come from the actual hole itself, but the event horizon. Another way to view this process is that the particle - antiparticle pair can occur close to the Black Hole event horizon. One of the particles would escape from the black hole whilst the other would fall in. If the particle that falls into the hole has a negative energy, this causes the hole itself to lose mass. If you are an observer, from your reference frame it would appear that the black hole has emitted a particle. Another process, Quantum Tunnelling, may allow the particle- antiparticle pairs to form from the vacuum of space and one can tunnell out of the event horizon. I will go into Quantum Tunnelling in more detail in my upcoming Quantum Mechanics series which is going to blow your mind. Promise! So how long will this process take? A black hole dying one particle at a time will take a soul crushing amount of time. For a stellar mass black hole this can take 10 to the 66th power to evaporate and a supermassive black hole can take 10 to the 98th power. That number is so astronomically ridiculous that I cant even come up with an analogy for it. As a black hole loses mass its temperature increases so when a black hole has a mass of around 10 to the 19th power it will be as warm as the sun feels to us now. In the final battle cry of the black hole it will also emit electrons, positrons (antielectron), protons and antiprotons. So in time, in the ridiculously distant future, the last black hole will be at the very end of its life. It too will follow in the fate of the ones before it. It will evaporate. So that must be the end of the Universe. Again, plenty more to come. Then we enter The Dark Era.